Forgive me, but I’m going to gloat and strut. I have, by dint of – okay, dumb luck – demonstrated momentary prowess in one of the great Manly Arts of our generation. Let me tell you, it was a great moment. I haven’t written about the MG in a long while, probably not since we had its delicate antique internal combustion innards ripped out and replaced them with shiny high tech electrics. We’d loved the idea of an electric car from way back, and the whole point of buying a cheap little MG Midget in the first place was to turn it into an electric car. Not so well. There were some problems with the electrics. Something about the battery pack not balancing correctly, cells getting low and failing. Brought the car back up to the guys in Santa Rosa who did the conversion a couple, three times. Not quite as easy to do when it’s got a 40 mile range and, well, is dead on the side of the road. So it meant putting it on a flatbed, which took some arranging, then a month or so of waiting for them to get it fixed, and another few weeks until they had a chance to flatbed it back down to Palo Alto. Over the past three years, the car spent more of its time belly up or away at the shop than on the road. And given that the beautifully-crafted sealed battery packs were loaded with touch-this-and-die high voltage, I wasn’t confident that there wasn’t a lot of debugging I could do when it did strand me at roadside, which was uncomfortably often. Other than, of course, calling the folks up north and asking when they’d be ready for me to ship it back up to them for another couple months of tinkering. The final time everything died, I pushed the car through a busy intersection and the final two blocks to the office. Took the help of a couple of passing co-workers to get it up the ramp into the parking garage, and that was the last straw. I’d pushed it home the previous two days, and could no longer ignore signs that I had strayed deep into The Land of Not So Much Fun Anymore. I thought back to the days before the electric conversion. Back when I’d first bought the car, when I brought it to Jeff over at British Automotive. I’d given it a naïve once-over before signing the check over to Tom and Katie. It had been been their grandmother’s (really!) and they were moving to Australia. I drove it a couple of times around the block before heading for home – the engine only had to be good enough to get me from Sacramento. Once. I brought it to Jeff to get a sense of how the rest of the systems were – steering, brakes, whatnot; whether I’d found a good basic chassis in which to put the shiny electrics. Jeff was appalled at my plan – said he’d never seen an unmodified Midget of this vintage with such good systems. And I was ripping it’s heart out? Sacrilege. But getting the electric conversion done took longer than I expected. The guy I’d originally been working with flaked out – stopped returning calls. Another year went by, and then another, before I found a second shop up north and dropped it off for The Operation. During those couple of years, I kept driving it. Helluva lot of fun, putt-putting around town, with the distinctive 1275cc four-banger popping and purring. Folks would roll down their windows and talk to me, tell me about how way back when, they owned a Midget, and how they still reminisce. Toothy smiles bloomed, and heads bobbed in appreciation. Yeah, right on. Some old white guy in his funky car – it’s cool, it’s cool. We talked, right there in the street, until the light changed, then they waved me off down the road. That’s what it was like, back then. But not so good these days, I observed. I ruminated, I moped. I wanted that fun back. Finally I called Richard Alwine up in Larkspur. 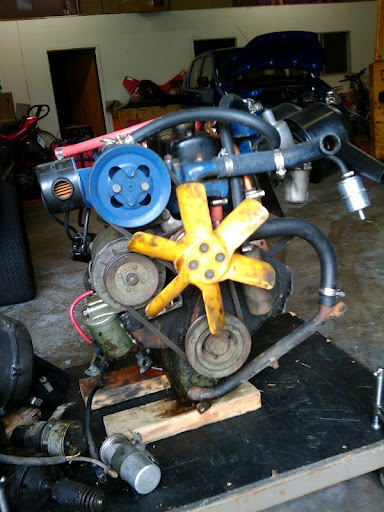 He’d been looking for a 1275cc engine for some project, and when we pulled the Midge’s engine out, I’d sold him mine. Now it was two years later. Did he still have the engine? Yeah, still sitting in the back of his garage, still wrapped in good intentions. Did I want the engine back? I promised I’d make it worth his while. Then I called Jeff at British Automotive. Yes, I explained, you were right. I was a fool. How much money to make it all better? We arrived at an agreement, and last month, the newly-reintegrated Midget came sputtering, puttering down the drive back home again, little four-banger drawing smiles and waves all the way. The fun was definitely back. As was, surprisingly, an opportunity to explore some of the Manly Skills. You, of course, know me well enough to recognize that I’m saying this in a purely chauvinistic spirit, in the spirit of stuff that guys are just supposed to know how to do. Because we’re guys, right? Like tie bowline knots, clean fish and fix cars. As enlightened and progressive as our society is, I don’t see my generation or the next getting out from the yoke of expectation that women know how to cook and men know how to fix cars. Anyhow. When Jeff handed me the keys back, he allowed that the Midge had gone through some pretty major surgery, and there were probably a few things that weren’t going to be working right yet. I should plan to drive it around for a week or so to shake things out, and bring it back to him for a checkup. He mentioned a couple of things he knew: they were stymied for now by the electrics for the blower, and the hazard lights weren’t coming on. But he figured I should take some time with the car now, sooner rather than later. Turns out that, in addition to the hazard lights, the odometer reset and turn signals were inop, the latter of which was a bit more of an issue on the streets of Palo Alto. So after a day of hand signals, I slung myself upside down under the dash with a multimeter, screwdriver and flashlight, and started exploring. Odometer was an easy fix. Took about 10 minutes more to pin the blower problem on corroded contacts in the rocker switch; some rubbing alcohol fixed that right up. Hazard lights were due to a loose connection in the center console, and a bit of wire tracing from there also brought the turn signals online. And so, after 45 minutes, I emerged from the garage triumphant, manly and only slightly greasy, having Fixed The Car. Now, I don’t think I could have done that when it was electric. I mean, I remember taking apart gasoline engines during shop class in Jr. High. The parts make sense, and there’s very little you can hurt – or that can hurt you while you’re messing with it. You get to take it apart, put it all back together, then gently push it through a few turns to make sure everything moves the right way before you introduce flame and combustibles. With an electric car though, well, there’s electricity. And you can’t just see electricity: a hundred plus volts at 40 amps that can fry you or burst into flame if your screwdriver touches the wrong thing. That’s…scary. Anyhow. As we crossed Middlefield, the engine sputtered a bit and died. Just died. We rolled off the crest, out of the intersection, and I hopped out and pushed us to a convenient parking spot on the side of the road. And here’s the funny thing: I didn’t curse. I didn’t lament. I debugged. Key on, crank the starter. Caught once, briefly, then just cranked dry. Key off, then on again. Not hearing the “dit-dit-dit” of the pump building fuel pressure, I pronounced, with entirely unreasonable confidence, that it must be the fuel pump. Miranda humored me, but reminded me about, you know, Chocolate, so I gave Devon a call and inquired whether she might bail us out. I returned to the scene that afternoon. Did I call AAA? No. Did I call Jeff at British Automotive? No, buoyed by an unreasonable belief in my skill at the Manly Arts, I engaged the stranded Midge with a handful of screwdrivers and a wrench set. 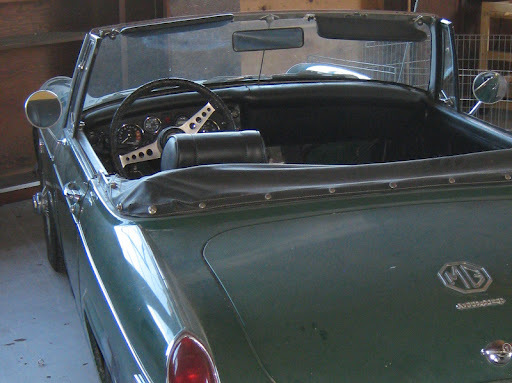 My handy Chiltons “MG Midget/Sprite” book informed me that the fuel pump (I was sure it was the fuel pump) was under the car, just forward of the gas tank, on the right side. Given that the Midget is, after all, a tiny car, there was no way I was going to be able to inspect it curbside. I could get a hand under there, but without jacking it up, a hand was all that would fit. But – ingenuity again (let me know if this gets tiresome, ‘k?) I had a phone. With a camera. Held it under the general area and hit the shutter a few times, managing to get one clear shot of the fuel pump. And a loose red wire dangling next to it. You know me well enough to know that this whipped me into a frenzy of manly self-confidence. How could I reach the pump? Yeah, the jack was obvious, but an enormous pain. But the driveway right behind my parking spot – if I pushed the car a bit up the driveway, then forward again, I could steer it so that it came out with one wheel up on the curb, and maybe just enough room underneath to fit. Short story (yeah, I know it’s way too long already to call it a “short story”): it worked. Nice lady on her porch across the street saw me pushing and came out to give a hand getting the car into position. 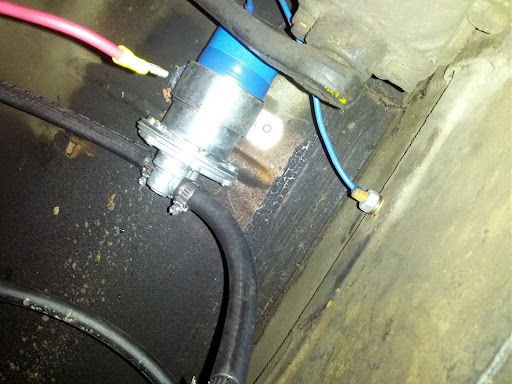 Fumbling my fingers around under the car, I found and reattached the errant wire to its connector, and was rewarded with a satisfying “dit-dit-dit” from the fuel system when I turned the key. Engine fired up on the third try; I put the hood (sorry, “bonnet”) down, bowed a grateful “Namaste” to my neighbor, and putt-putted home, now impossibly, impossibly proud of myself and smugly secure in my innate grasp of the Manly Arts. Okay. But I did sign up for AAA Emergency Roadside Service going forward. I may be manly, but I’m not stupid. ← Hey – look over there!